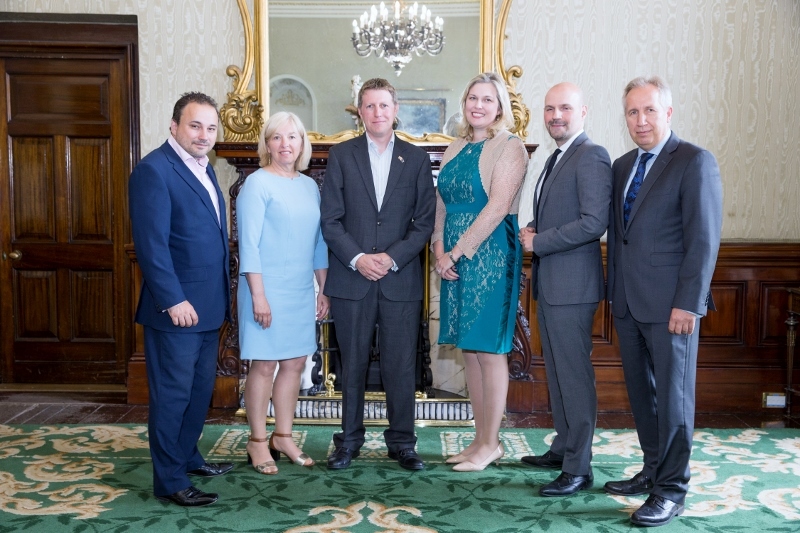 Our Chair Ian Parsley addressed a high-level conference in Iveagh House in Dublin recently, jointly hosted by European Movement Ireland and Konrad-Adenauer-Stiftung. He was joined by representatives from European Movements in Edinburgh, London and Brussels. Two Islands: Brexit and the Future of the EU- A dialogue on the potential implications of Brexit for Ireland, the UK and the EU at Iveagh House, Department of Foreign Affairs and Trade. (Pic: from left) Ian Parsley (Chair EMNI), Vanessa Glenn (Chair, EM Scotland), James McCleary (Campaigns Officer, EM UK), Petros Fassoulas (External Liaison, EM International), Noelle O Connell, Executive Director, European Movement Ireland, Hans Blomeier from Konrad-Adenauer-Stiftung. In a joint statement issued following the event, European Movement organisations from across the two islands said: “We reaffirmed our belief in the European Union as a force for good in the world, and we recognise the benefits of membership of the European Union. “Working together in Europe for over 40 years has put Europe at the centre of citizens’ lives, whether they are students, in business, or in other walks of life. “We agreed to work together over the coming months and years to ensure that the common issues faced by all our citizens can be properly reflected in the debate on the future of Europe. This is particularly important as the negotiations on the UK’s future in Europe are about to begin. EMNI were also represented at a major symposium, organised by Ulster University: “Brexit: What’s next for Northern Ireland and the EU”. On Thursday, 15th June 2017, the European Movement in Northern Ireland attended a conference hosted by the Human Rights Consortium in partnership with NICVA and with sponsorship from Unison, to move the Brexit conversation towards a solutions focused civil society engagement. EMNI continues to work with EMUK and EM Ireland in trying to push for NI’s interests in the forthcoming negotiations. We are also seeking, with organisations like NI’s Independent Forum on Brexit, to propose ‘imaginative and creative’ solutions, although it is very clear that even the best deal we come up with will not be near as good as the present arrangements with Northern Ireland enjoying regional status of a full member state of the European Union.